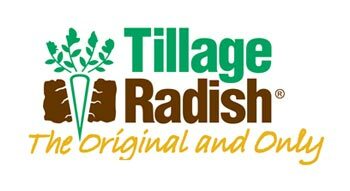 After more than a decade of research and development, Tillage Radish® has been awarded PVP pending status and is now recognized as a unique radish variety. This means the Tillage Radish® genetic profile is different from any other cover crop radish in the world. This also means no unauthorized propagation is allowed, so that farmers know exactly what they are getting inside of every bag of Tillage Radish® seed. Accept no substitutes. There are none. the only cover crop radish with proven claims. Notice how the taproot drills straight down to break up compaction like no other radish. Despite the claims of other radishes there is nothing else like the Tillage Radish®. 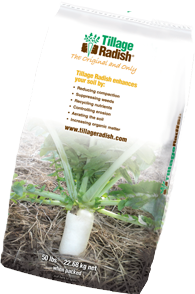 The Tillage Radish® taproot grows with amazing consistency all along its length. Root hairs grow from the tuber as well as along the taproot. But this taproot is hungry for nutrients trapped deep in the soil. This carefully extracted taproot was grown for research purposes. These very deep root penetrations build soil health deeper in the profile than any other cover crop radish. The taproot opens channels through compacted soil to enhance moisture absorption and capture nutrients for use by succeeding cash crops. If you want Tillage Radish® DO NOT ACCEPT DELIVERY unless you see this bag. deceptive claims of cheap imitators!